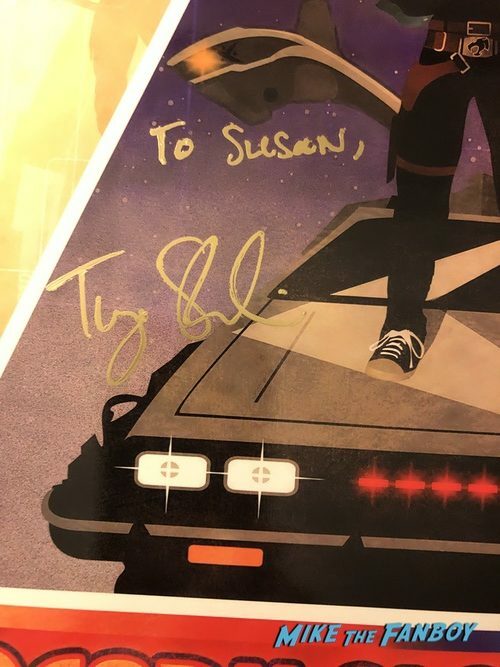 Home / Conventions • Suddenly Susan / ACE Comic Con Phoenix! Suddenly Susan Meets Michael Fassbender and Ready Player One’s Tye Sheridan! Autographs! and More! ACE Comic Con Phoenix! 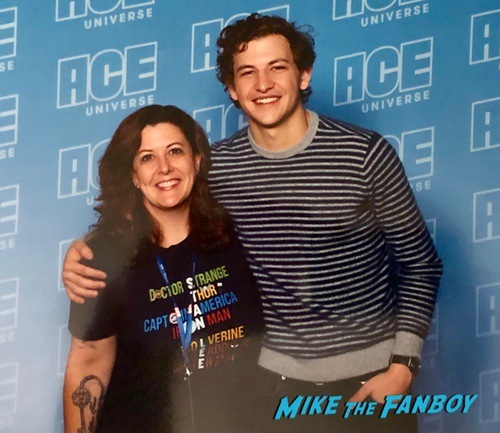 Suddenly Susan Meets Michael Fassbender and Ready Player One’s Tye Sheridan! Autographs! and More! I recently visited ACE Universe Comic Con in Glendale, Arizona. This was a quick weekend getaway and I’m so glad I made the trip! 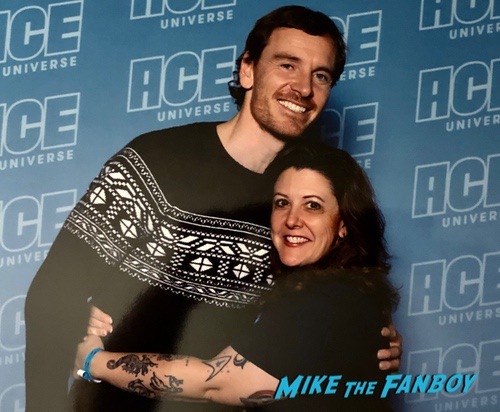 Michael Fassbender has been on my unicorn list for so time now and he was finally doing a convention, his first, at ACE Universe. I couldn’t be happier that he signed up with this company, as they are top notch and always make sure that fans come first. Also in attendance, to name a few, were Tom Hiddleston, David Tennant, Tye Sheridan, and Taron Edgerton. Talk about a star studded line up! I want to give a shout out to MTF fans Bobby and Mike who I met while walking through the halls. Thank you for saying hello and for being long time readers! Because the event took place in a sports arena, the layout was super easy to maneuver and the various vendors were laid out in a circle on two of the floors. This made it very simple to go back and find that rare item you were thinking about buying all weekend. The thing I love most about conventions outside of the Los Angeles area, is that I get a new variety. The same old same old takes its toll and I did come home with a few treasures I found around the floor. Thanks to the awesome screen viewing setup and seating within the arena, I was able to catch the X-Men: Dark Phoenix panel with Michael Fassbender (Erik Lehnsherr / Magneto), Tye Sheridan (Scott Summers / Cyclops), and Alexandra Shipp (Ororo Munroe / Storm), and hosted by Angélique Roché. I got some great insight into the upcoming film and can’t wait to see it. I was also able to see the panel featuring Charlie Cox where he chatted about his Netflix series Daredevil – The Devil of Hell’s Kitchen. I really need to start watching that show. 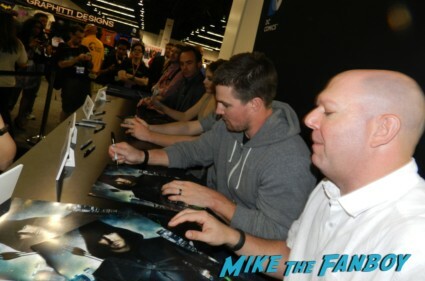 On to the most important part of the convention – autographs and photo ops! First up was my autograph session with Michael Fassbender. Now this could have gone off the rails thanks to an over zealous fan who bordered on stalker, but luckily all ended well. The nicest part of this arena, was that you were instructed to sit in the seats and wait for your session slot to be called. Sitting down? At a convention? Usually I have elephantiasis of the feet by the end of any con so this was a relaxing change of pace, especially considering I had a very recent knee injury. Once my group was called I waited approximately 15 minutes before my time in front of Magneto himself. I tell you, things could not have run any smoother. The big moment came and the “lady” in front of me had a home made hard cover book with photos of Michael and photos of herself placed behind him as if she was gazing at him. I told you – borderline stalker. She was ahead of me, got her booked signed, said a little something and then done. Time to leave now. But, no she stood here asking him stupid questions about Ireland. There was no security guard on the end to show her out so she just kept talking! 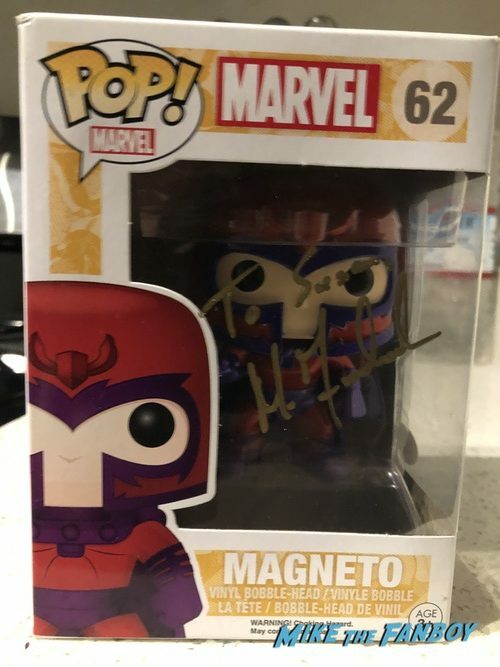 He couldn’t have been nicer, engaging her stupidity as he signed my special edition Magneto POP. My autograph was completely done and that lady was still talking. The handler with Michael looked at me like it was time to go and I said, he has my pen. Finally, Michael snapped to and realized I was there. “Oh! Sorry,” he said and shook my hand. Finally Yappy McGee left. I was NOT leaving that space until I officially met the man. I quickly told him how much I loved Centurion and Hunger and he thanked me, said it was nice to meet me and shook my hand again. A bit rushed, but I accomplished my goal. I also decided to get an autograph from Tye Sheridan. I’m old enough to be this kid’s mother, but he’s an incredible actor – check out Mud if you haven’t seen it – he’s amazing. 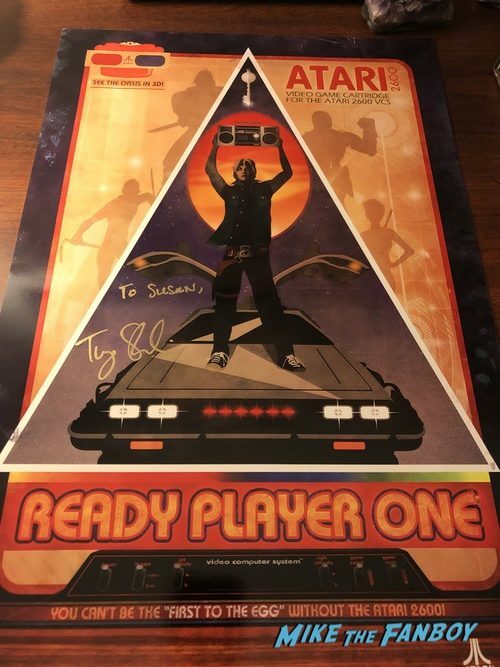 I found a very unique and cool Ready Player One poster at the con and so had him sign that. I think it came out great. He’s a shy kid, but very sweet and friendly. Next up were the photo ops, which ran just as easy as pie like the rest of the day had. The one with Tye is pretty adorable, but the one with Michael is just ok. Not my favorite, but I got to wrap my arms around him, so I’d call that a win. All in all a quick and easy convention with no major issues and for the first time, no cancellations – yay! Check out the photos from my experience and let us know what you think. Meeting The Cast Of The Newest X-Men Series, Legion! Dan Stevens! Aubrey Plaza! Katie Aselton! and More! Wondercon Day 2! Bill Paxton! Dragons: Defenders Of Berk! Jay Baruchel! Godzilla! And More! Wondercon 2014 Exclusives! 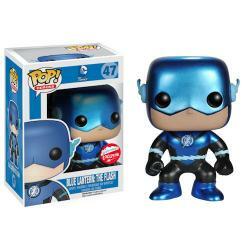 Funko POP Blue Lantern Flash! Wonder-Kale! Batman Comics! And More! Fassy! Such a nice picture Susan. You look cute together. I like Tye. Ready Player one was a shockingly decent film. I’ve bought it on Blu-ray. Great pics! Would have loved to seen more from the convention floor. What goodies did you get.